Every year, holidays have their various lessons about what kind of spirit we should maintain. Chrismas asks us to be joyful and spread good cheer. Halloween asks us to embrace the mystery and mischief of the season. Valentine’s Day hopes that we’ll embrace friendship and love. Thanksgiving asks us to be … thankful and giving. Flag Day … is a little harder to pin down, we suppose, but it is worth recognizing when we figured out what flag would represent our country! Of course, the problem is that we’re supposed to take those lessons throughout the year… not just celebrate those emotions for a night or two and then return to our normal selves the rest of the 364-some days! Fortunately, Halloween at least offers us a few chances to relive some of the other holiday moments because, obviously, it is the best holiday and that means the other holiday spirits want to show up to the party, too! So, it should be no surprise that the spirit of Independence Day is one of the first to show up to the holiday Halloween bash. You can foster that spirit of American pride by stepping into the red, white, and blue with this Uncle Sam costume. Sing your favorite verses of Yankee Doodle in this blue cutaway tailcoat jacket with red and white striped lapels and decorative stars throughout. 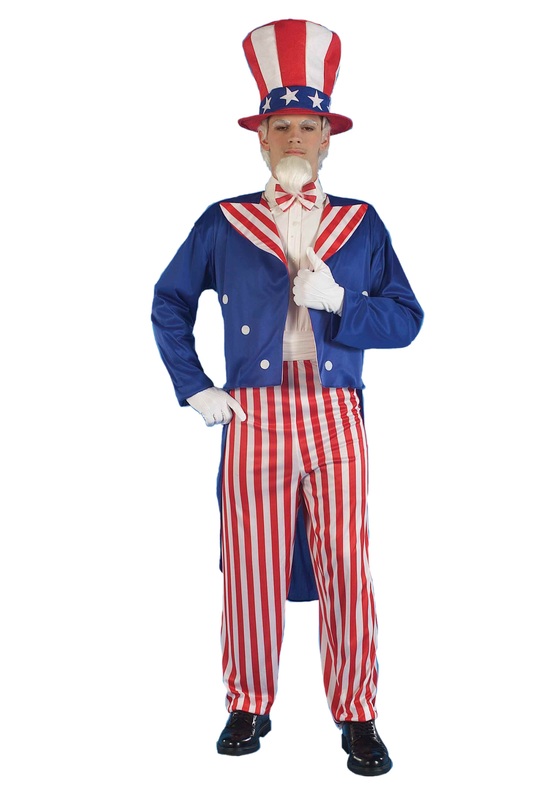 The streamer pants and bow tie both feature the red and white stripe look and the billowing top hat will be like the flag has knighted you its agent of freedom. Bring the Barbecue season to Halloween this year because We Want You!